The RD8100 locator can be paired to an external GPS device or use its internal GPS module when fitted to detect and store its latitude, longitude and accurate UTC time alongside its locating data using SurveyCERT™+ or the automatic logging system (GPS and Usage-Logging equipped models only). The presence of GNSS data allows for the data to be mapped easily and to export and save the information directly into GIS systems. Scroll to the GPS menu using the or keys. Press the key to enter the GPS menu. RESET: Select YES to reset the internal GPS (GPS equipped models only). INT: Select this to use the internal GPS if present. EXT: Select this to use the GPS from a compatible paired device. OFF: Select this to switch off the internal GPS module and save battery. SBAS: Select this to switch ON or OFF SBAS (Satellite-Based Augmentation System). SBAS can improve GPS accuracy, particularly in N.America. EXIT: Select this to exit the GPS menu. 4. Press the key to accept your changes and exit the GPS menu. 5. Press the key to exit the menu. Note: When SBAS is ON the GPS system may take longer to lock. RD8100 GPS models have an internal GNSS module. When internal GPS is enabled, it will automatically try to “lock” onto a number of satellites as soon as the RD8100 unit is turned on. The time required for the GPS module to lock onto the GPS system varies depending on the length of time that has passed since the last time the locator was used, and on the presence of obstacles (like high buildings, trees, etc.) that obstruct sight to the sky. If the unit has not been used for several days the time to first fix may take up to several minutes. The RD8100 locator display provides a number of icons indicating the presence of an internal and active GPS and when this has locked to the GPS system, the quality of the signal received or numbers of satellites received. 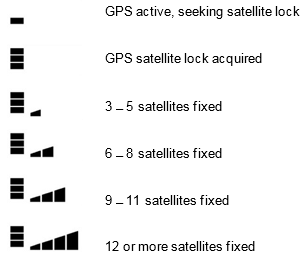 The accuracy of the GPS module is affected by the number of satellites received and best accuracy is only reached when the signal quality is at its maximum.